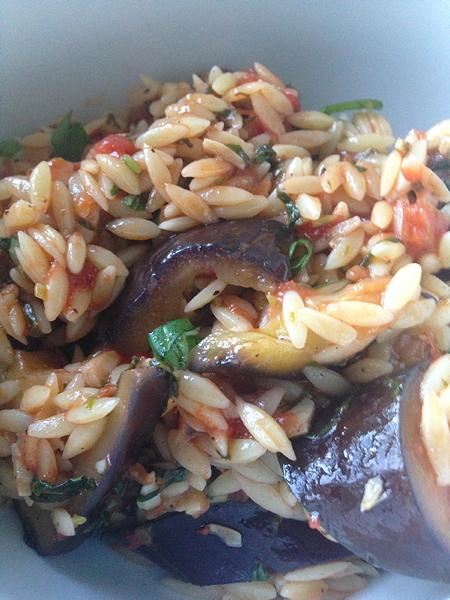 The combination of aubergine, tomato, garlic and basil has me salivating before I’ve even chopped anything. Heat the oil in a large frying pan, and when hot but not smoking, add the garlic. Cook for a few seconds then add the aubergine, stir quickly to coat in oil. Cook, stirring occasionally for about 5 minutes, then add the tomatoes and sugar, and a good large pinch of sea salt and a good few turns of ground black pepper. Stir. Cover and turn down the heat. Simmer for about 15-20 minutes until the aubergine is soft. Leave covered, and cool whilst you cook the pasta. Drain the pasta and add to the aubergine mixture. Toss everything together, adjust seasoning and serve. Previous PostPanzanellaishNext PostWhat am I knitting?